The basic parts of a resume outlined here are a tool you can use to understand how resumes are constructed. This list will also help you gather your personal data, organize it, and present it effectively in a professional resume. Every resume is unique … because each person and his experiences are unique. As such, there is no magic formula to presenting your information. On a resume, each element is usually listed as a separate section (apart from the contact information, which serves as the document title.) 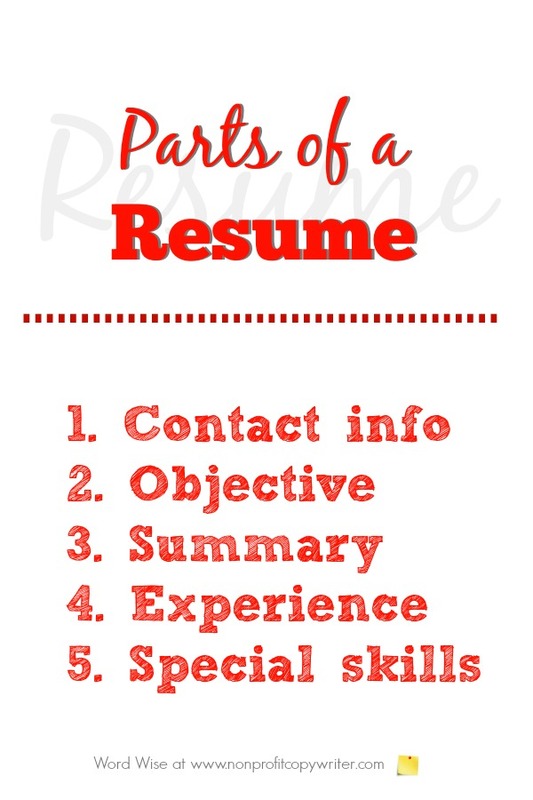 The parts of a resume can be renamed to fit your situation using different terms listed below. Place this information as the header of your document. Include your complete name, address, telephone number, cell number, e-mail address and website (if you have one). Other personal details are not necessary. The contact information allows a prospective employer to get in touch with you. Also called"Job Target" or "Employment Objective"
Your objective is a brief phrase or statement that summarizes the kind of position you’re seeking. (Here are tips for writing a resume objective.) You may list multiple closely related positions together, such as “Executive Secretary/Executive Assistant.” Recent college graduates and career-changers can indicate their search for “an entry-level position” in an appropriate field. If you’re pursuing more than one kind of job title, construct a separate job target/objective statement for each resume you build. Also called "Qualifications" or "Qualifications Summary"
This thumbnail sketch should showcase your most marketable skills and abilities with concise, bold statements. Communicate your key strengths, assets and character traits – intangibles -- and back them up with supporting evidence. Write this section last, after you’ve organized your resume content and can extract your strongest qualities. Use positive, pro-active, results-oriented language. Also called "Employment History" or "Work Experience"
This is the place to put important or interesting information that does not fit anywhere else. List honors, awards, professional affiliations, security clearance ratings, and special skills, such as your ability to speak a foreign language, fluency in computer programs, or musical skills. Make note of any published works. If you’re a college student or new to the job market, list extra-curricular activities, including leadership roles you’ve held. Most employers expect you to provide references, so you needn’t necessarily state that you have them. However, if you choose to include a “References available upon request” statement at the end of your resume, never list the references themselves on the document. Instead, create a separate sheet titled “References” that includes your name, your contact information, each reference, your relationship with the reference, and the reference's contact information. Have copies of your reference sheet available to hand an employer during an interview or to send in an email when requested. You do not need to include information about your family, marital status, gender, race, or religion on your resume.